Grey resin. See body text and images for details. Exquisite detail; perfect casting; no cleanup required; useful for a wide variety of subjects. GasPatch Models has delivered a truly exquisite line of beautifully detailed resin accessories. 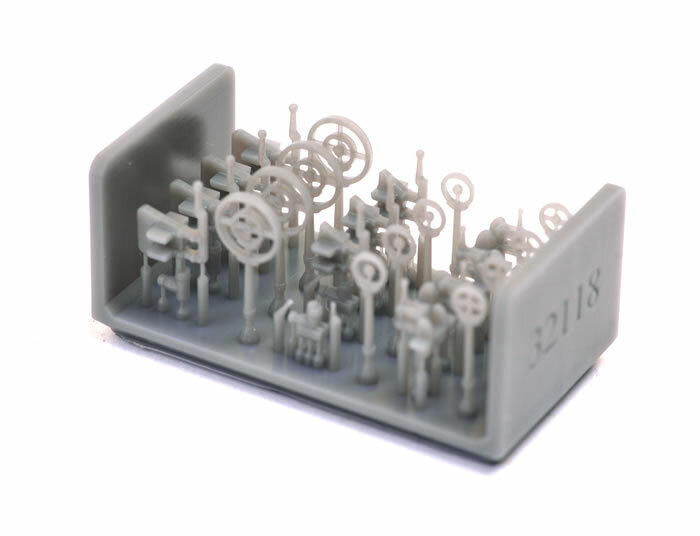 These will truly be the jewel in the crown of your 1/32 scale WWI aircraft models. GasPatch Models has been in the spotlight recently thanks to their beautiful pair of injection moulded 1/48 scale Henschel Hs 123 kits, but they also produce a good-sized line of accessories. These include a growing range of machine guns that are suitable for WWI, between-the-wars and WWII subjects. They also offer wheels, gunsights and other related accessories. Packaging for all the sets is simple but effective. The parts are contained in a clear blister pack and immobilised by custom-cut foam to ensure the delicate parts are delivered in perfect condition. All of my samples are free from any damage. Assembly is pretty much self-explanatory. 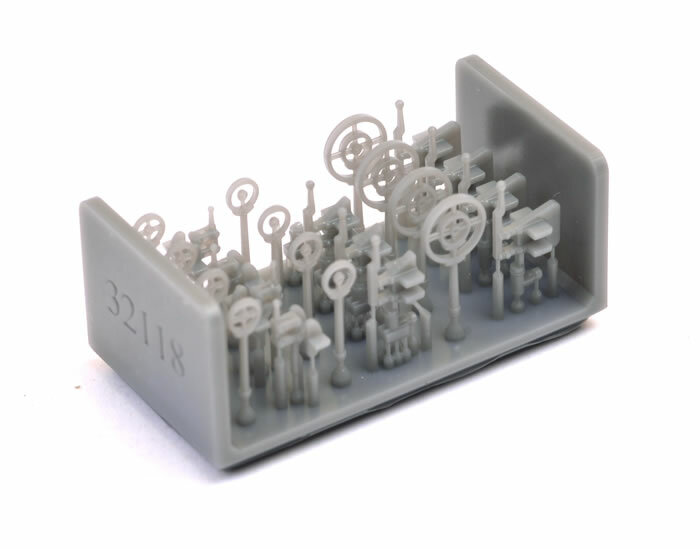 Gaspatch has released three types of gunsights in a set with a total of twelve ring and bead gunsights. The gunsights are cast in grey resin. Detail and finesse is mind boggling. They demonstrate the three-dimensional effect of the real thing, while retaining scale thinness. Each gunsight is cast onto a fine resin strip with a small attachment point. These will be a handy accessory for many WWI guns and beyond. Two guns are incuded. They include breech, barrels and ammunition belts. The detail is truly specacular, while casting quality is perfect. 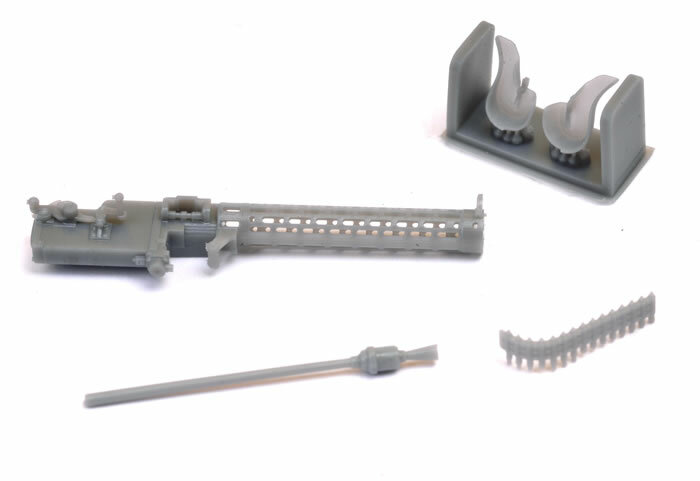 Most of the parts are ready to use straight from the blister pack, with only a little preparation required to remove two of the parts from fine resin attachments. The guns really are very impressive indeed. Some of the parts are delicate, so care will be required when handling and painting. These wheels are designed for the Sopwith Camel, but they will suit a range of other British aircraft too. The casting of these spoke wheels must be seen to be believed. 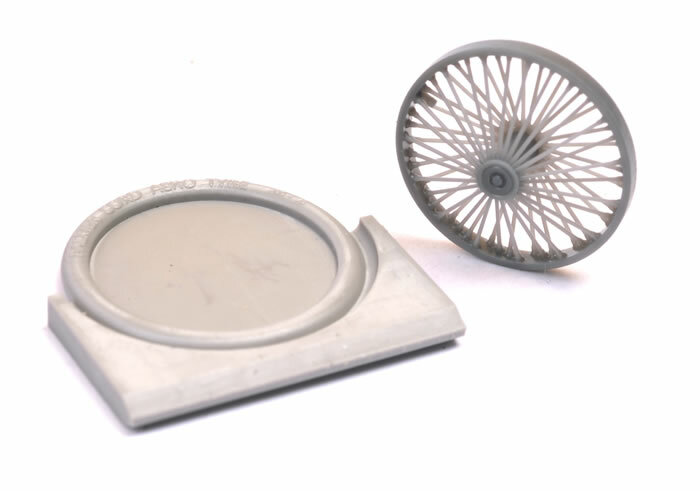 Each spoked wheel is miraculously cast as one piece, with another resin piece supplied for the tyre. These are quite simply the best spoked wheels that I have seen. The resin media allows each of the incredibly fine spokes to have a round profile, unlike the flat spokes of photo-etched versions. The tyres also feature raised lettering on the sidewalls. Assembly could hardly be simpler, with the tyre simply needing to be removed from a fine crescent casting strip and glued to the one-piece spoked wheel. This is an amazing accessory. 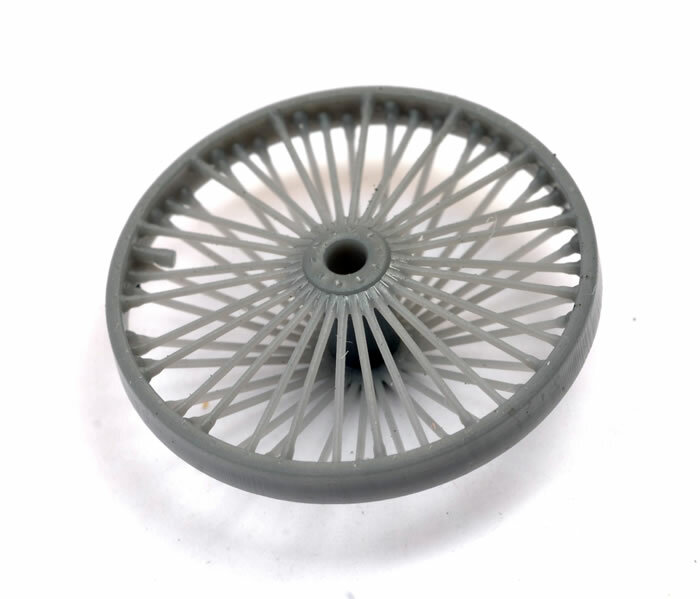 If you are building a 1/32 scale Camel or a similar aircraft, do yourself a favour and grab a pair of these wheels. This is only a small selection of the guns and other accessories on offer. I would encourage you to visit GasPatch Models' website to see the full range available. 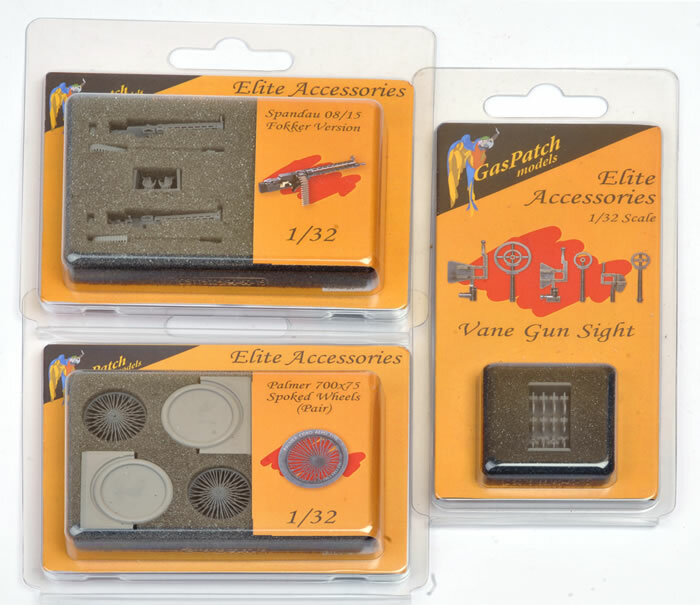 GasPatch describe these guns as "Elite Accessories" and this is no exaggeration. They have delivered a truly exquisite line of beautifully detailed resin accessories. 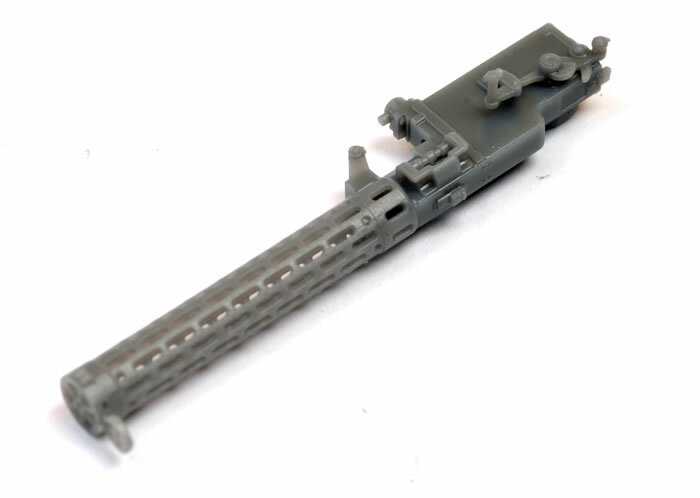 They're not cheap by any means, but in my opinion they are worth the price, in particular the guns and wheels that will be very prominent on your finished model. Thanks to GasPatch Models for the samples.